I've heard of folks making knives form lawnmower blades. Anyone here done it? Do you need to heat treat/temper/anneal the blade? What did you shape the blade with? If the mower blade is flat, you can make a blade by stock removal. Careful not to overheat the steel. If the mower blade is not flat, you would need to anneal it, beat it flat, then shape and re-harden. If you're making a larger, chopping type of camp knife, mower blade might work. I doubt that you would want a finer hunting/skinning/belt knife out of that type of steel. As to tools, I use belt grinders, files and sandpaper. Files work great on annealed steel. Grinders are faster. That's not always a good thing. Grinders also work on hardened steel but heat is your enemy. I am right there with you Bream. I have been studying up on this for quite some time, so when I am ready to play at least I will be educated. Steel is tempered by cooling it quickly in a liquid once it gets hot, and this makes it harder / more durable. Steel is softer when it is heated past the point of it being magnetic and cooled slowly ( annealing ). To work any hardened steel it first should be annealed which will make it more pliable. Once slowly cooled, or while still hot, you can more easily beat and shape the metal. Blacksmiths have an anvil to beat on hot steel because it is easier to form that way. Once formed you heat the steel again past magnetic and then quench it in either water or oil to realign its structure to "harden" it. I have no practical applications as of yet. IF you intend to beat files, lawn mower blades or any metal into a shape you need a way to heat it, like a blade forge setup. Try googling around and there are several ways to make a forge with force air propane and clay pots. The show on the History Channel "Forged in Fire" deals with a lot of different kinds of steel, from start to finish. I like the show a lot. Lawn mower blades work fine, but since the title of the show is "Forged...." there has to be some forging involved. I think hammering the blade to harden it, certainly for tempering it. The challenge is always 1. Create your own knife using available materials in three hours at the very well equipped home forges, one person is eliminated, 2. is to attach a handle and cure any problems, another three hours allowed, after which another blacksmith is eliminated, Three is the remaining two working at home forge and producing a weapon, and 4. testing that weapon. The forgers are all professional blacksmiths and have a lot of expensive looking machinery, and they're experienced. They are given tasks at their home forges and do some impressive work. Comes on Tuesday at 9 p.m. Didn't you make one? If so, please... tell us. I'm looking at replacing lawnmower blades soon. I could scrap them, or if I can just do my own cutting and get a semi-functional blade... why not? My most recent. Not from a lawn mower blade but a table saw blade. Learning the skills of shaping and grinding bevels before I worry about heat treat. It's a lot of fun and frustration. On Forged in Fire, one dude used a lawnmower blade. Forged it cause that was part of the show. He did have to heat treat the finished blade. My grandfather made kitchen knives from cross-cut saw blades. Still have a few around here, somewhere. I have built a bunch of knives: from kits, blade blanks, scrap steel and bought steel. The most fun ones are the scrap ones because it has a story. I annealed the lawnmower blade in a bonfire, hammered it flat, cut it to shape with a porta-band, ground the bevels on a bench grinder (belt type), heated it to non magnetic with acetylene, quenched in peanut oil, tempered in the oven, then added handle scales. I'm in the process of building a forge out of a couple of 18-wheeler brake drums, a piece of 4" pipe, and some fire brick. I'll use a leaf blower or a retired vacuum cleaner as a source of air for the forge. Already got a 150 lb. anvil and a big hickory tree stump to mount it on. A buddy of mine made a patch knife out of a file. It's sharp and I attached it to my shooting bag. Perhaps a bit thicker at the back than it could be, but cuts a patch just fine and is there when I need it. 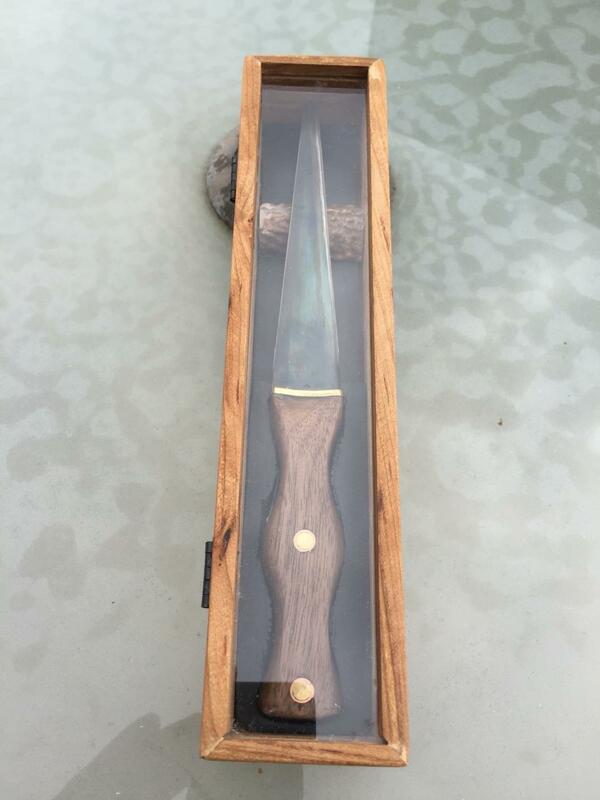 I got one of those damascus blades on-line and a pair of scales in curly maple. I had a guy put them together, and it could have gone better...left a ridge on top which needs to be ground down. But it is a very good blade and extremely sharp. I want to make a new handle for this one, too. Probably going to get a micarta or some other synthetic. Make an aluminum guard for it. And a kydex sheath. Oldtime blacksmiths could change the carbon content of a blade or other piece of steel by the way they heated and hammered it, and by the fuel they used for firing the forge. Coal, coke, charcoal, etc. and the volume and velocity of the air that gets blown through the forge all has an effect on the final properties of the metal. Buying already-alloyed steel is sort of like dating a chick with fake hooters- - - -it takes some of the pleasure out of the whole experience! The Japanese would increase carbon content by putting straw in with the iron as it was being hammer forged. Edited to add: I guess if I wanted to really get crazy I could get ore or even iron sands and smelt my own iron. I've also got a low-speed grinder that runs the abrasive wheel in water. It's designed for doing the type of metal removal that doesn't overheat the workpiece. It's actually made for sharpening woodworkers' tools like chisels and plane blades, etc., but it also works well for shaping knife blades. Lots of folks are buying Old Hickory kitchen knives and repurposing them by grinding the profiles and adding handles. They're supposed to be good knives already, and cheap. I guess if I wanted to really get crazy I could get ore or even iron sands and smelt my own iron. That would be kind of cool to do one time just to experience the whole process. I have problems with adding scales to a pre-formed blade. I can't imagine smelting iron ore and then turning that into carbon steel. Certainly not a first project. I saw a program of a guy who did just that and made a Viking sword. It took him a very long time. I've got a 14X2X3/8" chunk of black steel that I'm going to hack into shape some day... If I ever get the kit knife I started into something resembling a completed project.